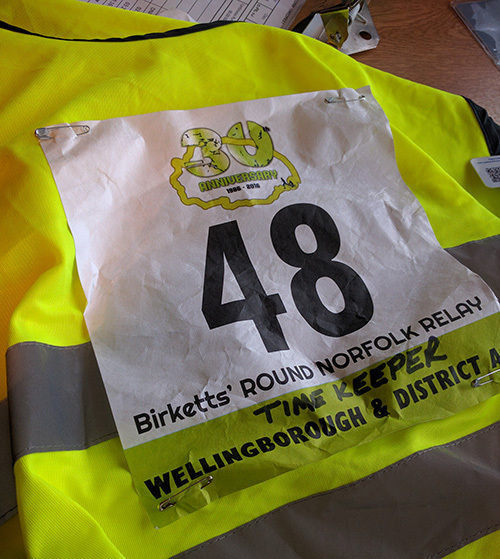 The Round Norfolk Relay, held in the middle of September, is a race that has been on my radar for a few years now. 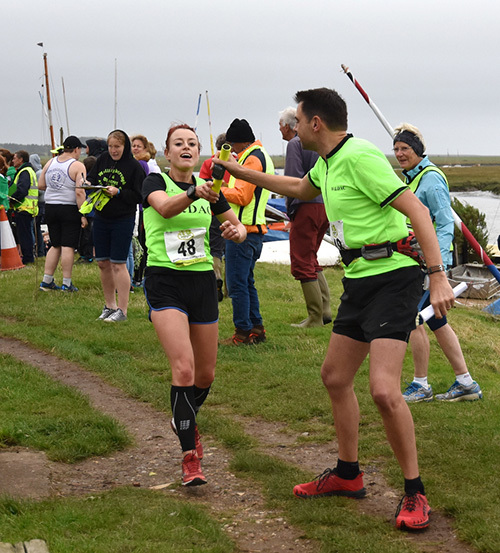 The team race is run around the entire boundary of Norfolk (198 miles from start to finish), split into seventeen unequal distances with both trail and road sections and seems to attract a great number of clubs from all over the country year on year. 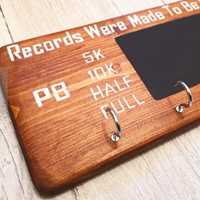 It was very early on in the year when one of the guys at club mentioned in passing that he would like to organise a team of runners from our running club for the event this year. 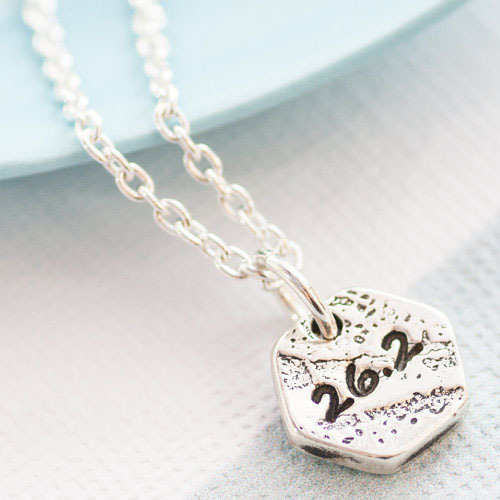 I threw my name forward as a potential runner for one of the stages, not knowing at the time that I would be pregnant (and quite so far along) when it came to race day itself. Although I grew up in North Norfolk and with my parents still living there, the amount of miles I have covered in the surrounding area is much less than I would like. Knowing much of at least the North Norfolk section of the RNR course I would love to have explored the course on foot as part of a race team. 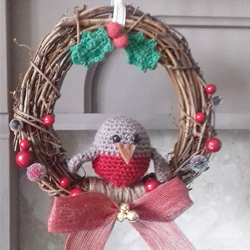 However, with the race falling just a fortnight before I was due to have my caesarean, it wasn’t to be this year, and all I could do was sit on the sidelines and offer to volunteer and crew where required. All those who had agreed to help crew the team met up at the pub a fortnight before race day to learn of our roles and talk plans through for the race. It turned out that there are some very strict rules for the race to prevent disqualification and we needed to know all of them. Each of the runners had requested either a road or trail section of the course, and a short or long distance section to run. 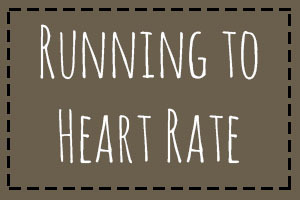 Each club is responsible for timing their own runners at all sections of the race. I was down as the timekeeper for legs 1-4. 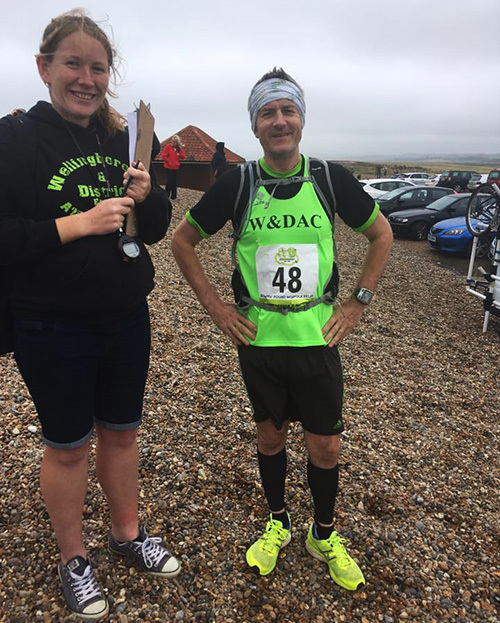 This meant that I needed to arrive at the second checkpoint (Hunstanton) at 8am on race morning to collect the stopwatch from Colin and Gillian who would be starting it at Kings Lynn when our first runner, Zac, began the race. Turns out there wasn’t just one stopwatch…there was a box full of stopwatches, as well as phones and other devices all set up for timing in case of failure! The weather was awful when I arrived at the first handover point. Up along the clifftops by the lighthouse in Hunstanton the wind was beastly and, despite being 37 weeks pregnant so fairly heavy, there were points where I thought I was going to get blown right over! Luckily, Colin and Gillian had already arrived and claimed a spot right next to the window in the cafe alongside where the baton handover would be taking place. They were there along with our stage two runner, and the partner of our runner from stage one. We had a little wait before Zac was due to come through, so made the most of the shelter and hot drinks the cafe had to offer. Once Zac was through, and Helen had set off on leg two of the race there was time for a quick debrief on how Zac thought his section of the race had gone. The weather had been brutal for the entire time he had been out apparently, although luckily, he missed the hail that began just as Helen started her section! Stage three began at Burnham Overy and this was the stage Colin was due to run, so Colin and Gillian also headed over to the little hamlet where we once again met up. There was no cafe to shelter in here, although luckily, the weather had improved somewhat by this point. I should have used the toilets in Hunstanton though, as the only toilet was a cold, outdoor one owned by the sailing club with a weight to keep the door shut. It did the job though! Helen’s stage was 14.06 miles so we had a fair wait around here for her to come in. 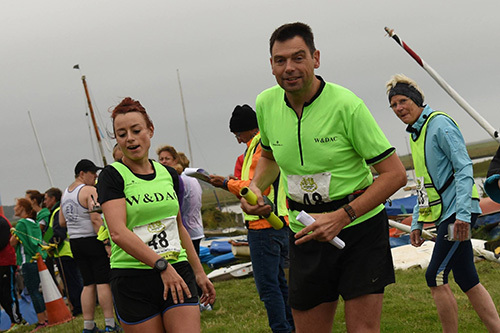 As timekeeper, when Helen handed over the baton to Colin I had to log the overall time taken since our first runner’s start time onto the official timing sheet. You can see me wearing my WDAC hoodie in the background of the above photo doing just this! There are some fantastic shots of runners out on the course which were shared on the RNR Facebook page. (All of the images I’ve used in this post either come from there, are shots runners from my club shared on our club Facebook group, or are ones I took myself.) 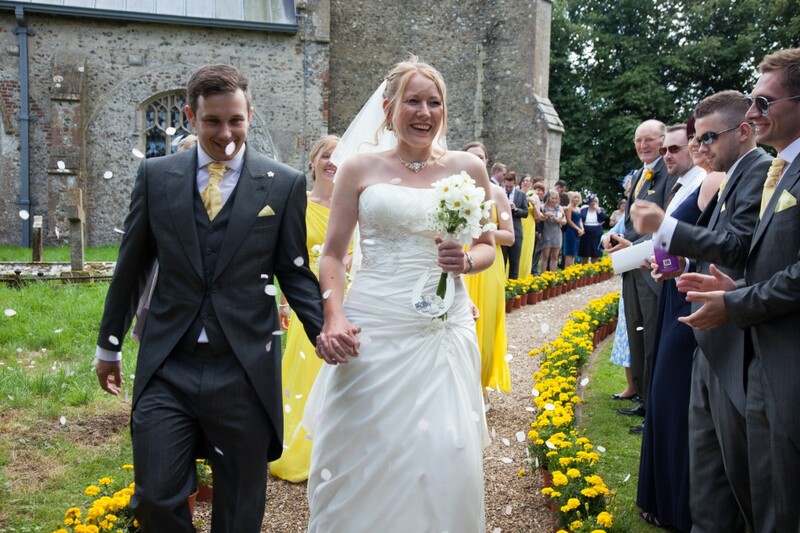 Had I not been so heavily pregnant and with a list of people to see longer than my arm whilst back in Norfolk, I would have hung around a little longer with my own camera to take a few shots after my crew shift was over. Colin’s section was a fairly short one at just 5.76 miles so I got a wriggle on to make my way to Wells and the start of leg number four. Here I met up with our fourth runner, – James, and we sheltered along the side of the embankment whilst waiting for Colin to arrive. 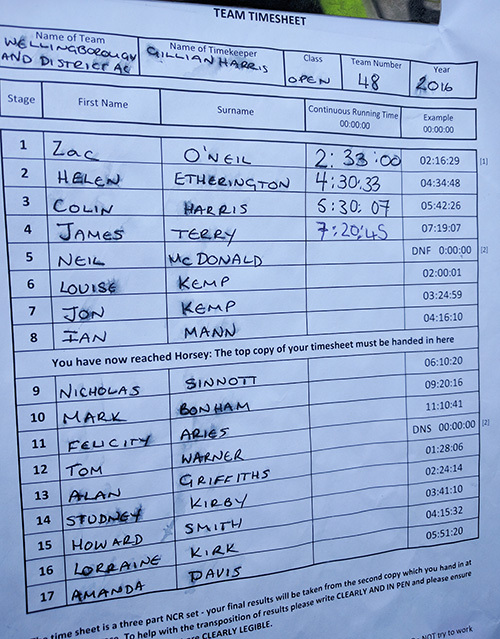 James had another fairly long section of the race from Wells to Cley with 11.14 miles of running. 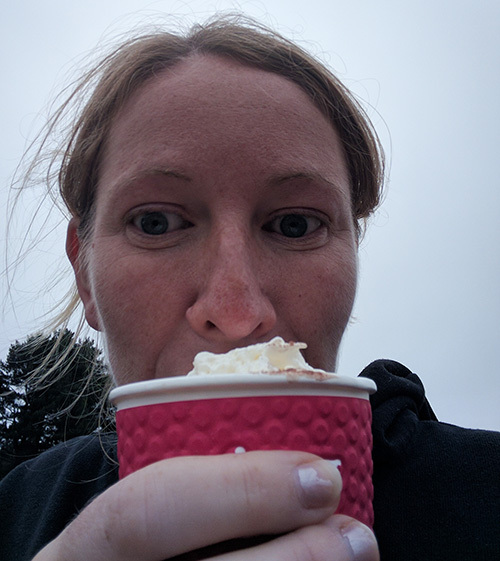 Having hung around for quite a while at the previous checkpoints waiting for runners to come through, I figured I had plenty of time to use the Wells beach toilets and pick up a hot chocolate from the beach cafe. That hot chocolate was very much required by this point. It was freezing out there and I was glad of all the layers I’d put on that morning! Having loaded my car up once more I pootled along the coastal road towards Cley. 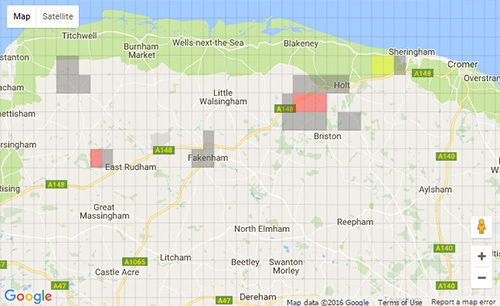 I got a bit panicked as I reached Cley though. Cley is a fairly small village with a tiny high street which bends round a handful of shops. Notorious for it’s tight turns and cars parked on the side of the narrow street at the best of times, this weekend it seemed all was at a standstill! With support and visitors for both the Round Norfolk Relay and also a 1940s weekend held in a local coastal town taking place on the same day, traffic was high, and with a few buses and larger vehicles who had stubbornly refused to wait, there were two lanes of traffic alongside a row of parked cars and nowhere for the traffic to go! We were at a complete standstill for more than 20 minutes before somebody had the sense to get out of their car and manage the traffic and drivers to tuck into side alleys and back up so that one lane of traffic was able to get through, clearing the road for the other direction as well. 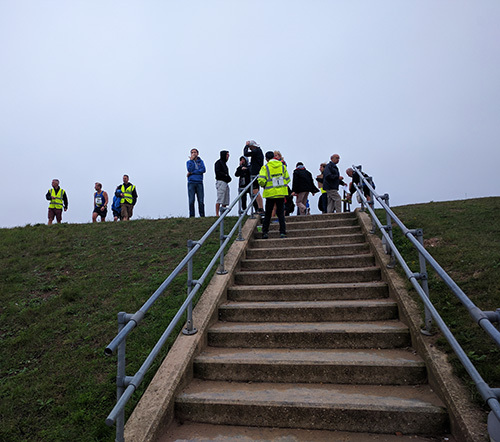 Despite being less than a mile from the coastal car park where I was due to meet James, I had watched the time I was due to arrive by tick past, and, as so many of the runners and crew had also gotten caught in the Cley traffic jam, the queues to get into the car park were now also tailing right back. As soon as I had parked up, I leapt out of my car with clipboard and stopwatch, racing over to the shingle bank where the handovers were due to take place. Luckily, James had not yet arrived and it was here that I met up with Neil, our fifth runner of the day. 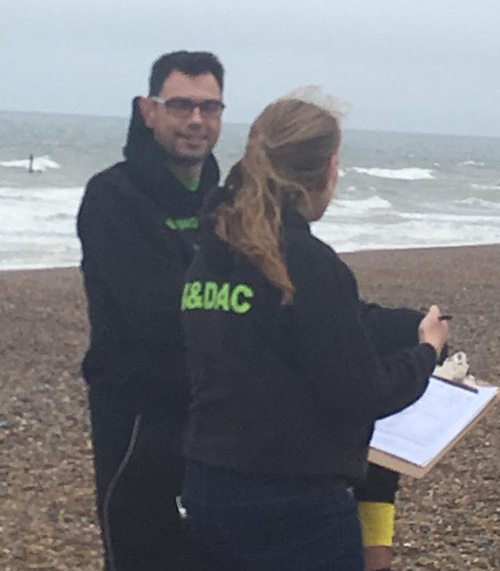 We actually ended up having quite a wait, and were beginning to grow a little concerned when two guys wearing Bedford Harriers tops made their way over to us to ask if we were the timekeepers for WDAC. On saying that we were, we were shown the race tracking on their phone. They pointed out the lovely line of flashing runner numbers headed in to Cley through the village, then scrolled up the online map a long way, to point out where our tracking number was flashing! James had missed the turning! (Very easily done, and he wasn’t the only one.) It did mean that I needn’t have worried about not getting there in time for the baton handover at least! 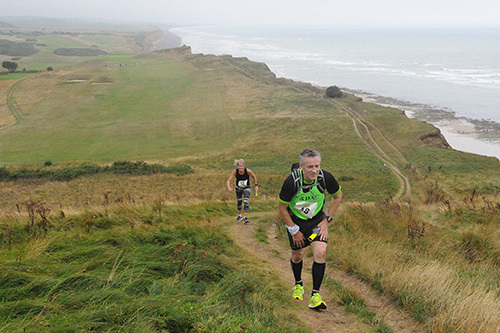 Neil had a stint of 10.81 miles from Cley to Cromer along the cliff tops. I’m actually tempted to print off the instructions for this section whilst I’m on maternity leave and have a go at it one time I’m back in Norfolk, as I’ve never even walked this section before, despite it being so close to where I grew up. Even though Neil had nearly 11 miles of trail to travel I wasn’t taking any chances this time and so sped straight off to Cromer. I wasn’t due to time the handover here, but instead, hand over the equipment to the next nominated timekeeper for our club. 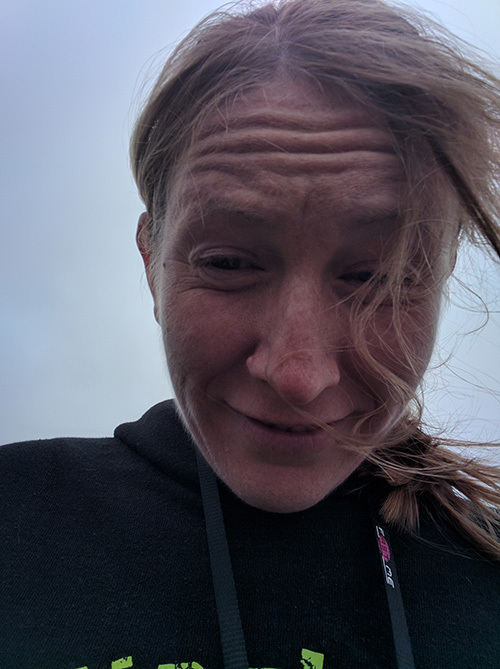 Along with the timing sheet and rules attached to the clipboard, I also carried with me parking passes, spare pens, a number of started stopwatches, a pack of water, and a first aid kit, which all had to be hoisted into the car of the next timekeeper. I didn’t hang around to see Neil in, as it had already been a long day and I was ready for a shower and to sit in front of the fire for ten minutes before heading back out for lunch and dinner plans with friends. 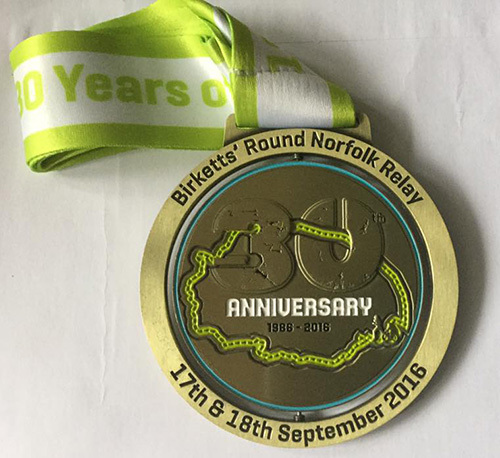 A huge medal, rivaling the London marathon medal in size, the front of the Round Norfolk Relay medal contains an outline of Norfolk (the race route), the date and name of the race, along with an embossed 30th anniversary logo. 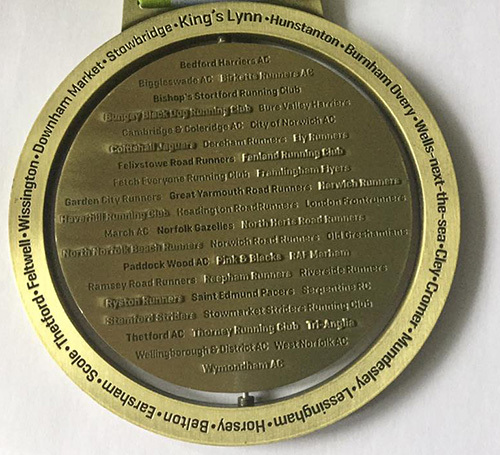 The back of the medal lists all of the running clubs who took part in 2016, with a list of all of the checkpoint locations around the outside. The inner section of the medal spins round on a pivot. 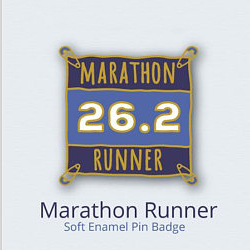 Very jealous I couldn’t run this year! I didn’t even realise that there would be medals at the event. I hope they’re just as good next time! 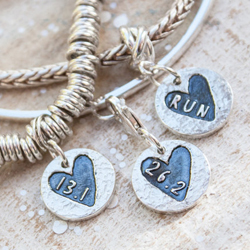 To meet the time restrictions, the whole course must be completed at a minimum of 8:40 minute miles on average. Some of the runners in our group were slower than this, but some, much quicker, so it all evened out in the end. 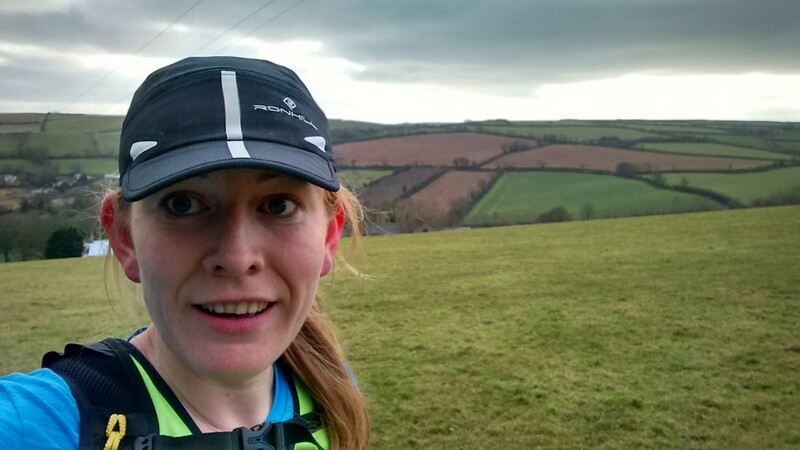 I followed our runners along via social media and the tracker after leaving. 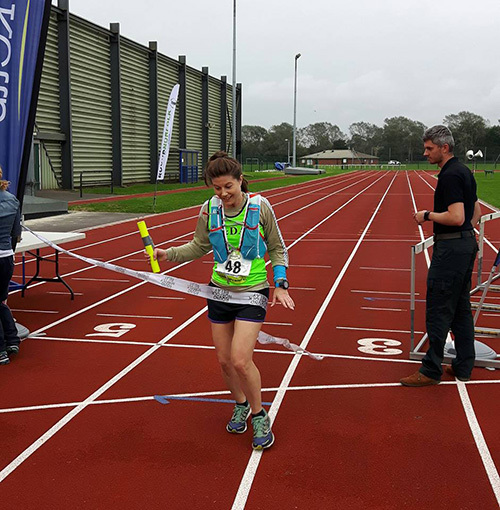 Our final runner, Amanda crossed the finish line after our first runner had begun 28 hours 55 minutes and 31 seconds earlier. Have you ever taken part in a similar event? 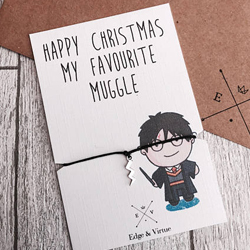 What has been your favourite medal design? 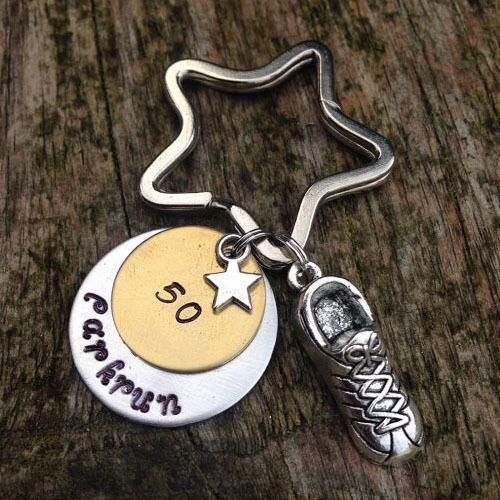 What a great idea for an event- and a fab medal too! 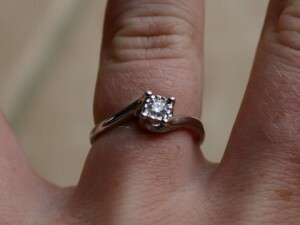 Your dedication to supporting at events like this is just brilliant, especially when you were so very pregnant! I just love events like this. Even though I couldn’t achieve much race-wise during pregnancy, it was great to be able to support others and see them achieve instead. 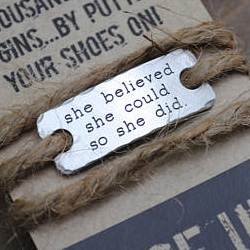 Wowza, you are awesome to have supported this race so far along in your pregnancy!! Sounds quite cold and stressful, but it’s always nice to help out and be part of it even if you can’t actually run it.